The hashtag #Rs32 is trending on Twitter in India today. So is Planning Commission. The reason? The Indian Government’s Planning Commission just published a report which re-defines what it means to be poor, and in the process they magically removed a huge chunk of the population from the official figures for people living below the poverty line. And so they’ve changed who is, and who isn’t, eligible for government subsidies due to being on the BPL (Below Poverty Line) list. 32 Rupees per day is the new limit they have just announced. According to the PC if you spend more than Rs 32 a day on Food, Health and Education then you’re above the poverty line. And this figure is just for city-dwellers — for rural areas the figure is now Rs 25 per day. 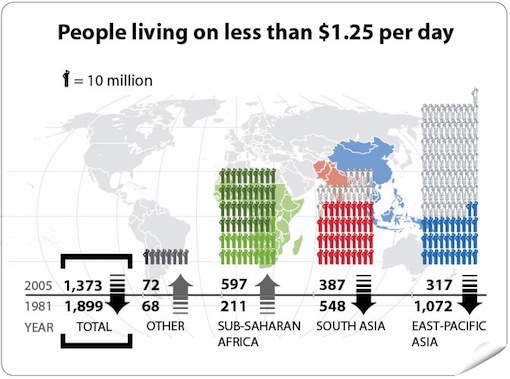 The World Bank’s definition of poverty, meanwhile, is living on less than US$ 1.25 a day. Not surprisingly, there’s been something of an outcry in the media here, as well as widespread disbelief. Adequate Food, Health and Education on almost exactly HALF of what’s widely-considered to be the absolute minimum? And this doesn’t even consider Fuel, Transport or Housing… I regularly see families here living on the building sites where they work, and collecting firewood wherever they can in the city so that they can cook, but does the government seriously see this as the norm? Meanwhile, things are only going to get worse. Inflation in India was running at 9.78% last month (a 13-month high), and has been over 8% for a year now, which makes it the worst among the so-called BRIC countries. And food inflation has been even higher while I’ve been living here — rising above 10% earlier in the year (and again last month), and causing a notorious crisis over the price of onions. On top of all that, the IMF said today that even higher commodity prices could mean another 44 million people world-wide could be pushed into poverty. So it’s a bit of an understatement to say that this really doesn’t seem like a good time to be fudging the figures so blatantly. From the initial response in the media and on Twitter it seems like the government will end up paying quite a price for this, and you can bet it will be way more than Rs 32.